Above: Welcome to RICCY’s Cafe. 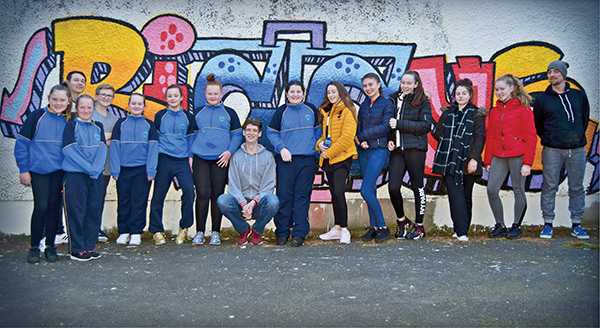 Ringsend Irishtown Community Centre Youth Café (RICCY’s Café), located on the Irishtown Road has been open since November of 2015 and has become a popular haunt for the kids in the area. Newsfour met the RICCYs café team; Niamh, Amy, Pierce, Brendan and Stephen who were only too glad to show me around this colourful and vibrant hub for local youths in the area who want to socialize, play and develop their skills in a friendly environment. Upstairs above the café, Pierce and Brendan present their plans for a music studio to me. Pierce rhymes off the inventory which already has everything an aspiring DJ/music producer would need. Top quality equipment from big brands such as Numark and Pioneer, (timeless) drum machines from Roland and Korg, MacBook Pros equipped with Hercules DJ Controllers, software including Reason, Abbleton, Logic and various others and classic Technic 1210s for those interested in learning how to mix vinyl and they have room for their drum kit too. Pierce says he needs more funding for his dream to become a reality, where he can allow the local youths to step into a singing booth and express themselves. Pierce has been in the music business for 20 years and has operated record labels such as Dubhouse and Unity Records, producing records in CD, Vinyl and digital format and has produced music of his own under various aliases; Happy Camper, D4 Destroyer among others which got him signed up by big names such as Tidy Trax records. Downstairs, the rest of the crew sit planning the weeks ahead. Niamh runs over the week’s events, which include the Junior Leadership programme which allows local youths who are interested in organizing events and running businesses to find their feet. Projects to come include the Cycle Against Suicide as part of their regular Young Men’s group meetings. “Here, they will learn bike maintenance and get involved in a project tackling suicide in their area. The idea behind Young Men’s group is to provide a space for people to speak about things they usually find difficult to talk about,” Niamh told NewsFour. The layout of this youth centre exudes an artistic mindset and it was of no surprise when Niamh told me they have facilities for spray painting for those graffiti artists in the community. Amy told NewsFour that they had recently completed a stop-motion animation titled ‘Alight’ with first-year students from Ringsend, with the technical aids of visual artists provided by the Arts Council and the Dublin City Council. Niamh and Amy are also planning a ‘women’s empowerment project’ which Niamh says is an art project that will also allow participants to improve their presentation skills. RICCY’s Café are also looking for anyone interested in joining their pool team with the hopes of playing against other youth clubs to test their skills. If you are interested in any of the topics mentioned, you can give them a call on 01-5159523 for a full list of activities or check out their Ringsend and Irishtown Youth Service, Facebook page.